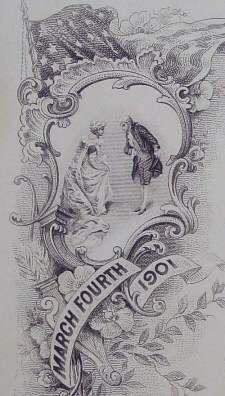 This cute little item is a 3 x 5" 1901 Inaugural Ball program and dance card. In those days there was ONE inaugural ball, not the plethora of balls that now occur on the evening of Presidential inaugurations. In March 1901 William McKinley was inaugurated into his second term as President and Theodore Roosevelt was inaugurated as Vice President. Because of the assassination of President McKinley later that year in Buffalo, Roosevelt then became President. 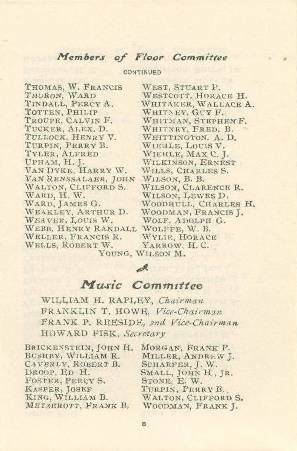 The program lists the many people involved with the inaugural committees, one page of which is shown below. 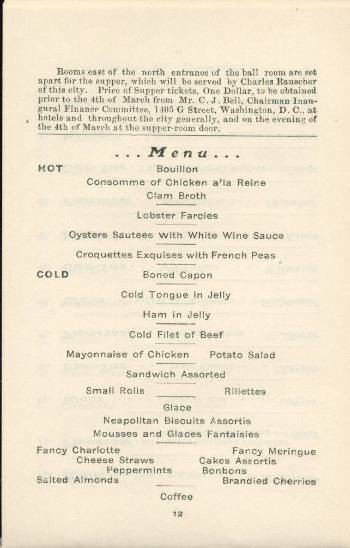 The program also has the ball supper menu, for which diners had to pay one dollar. The start of the program and the listing of dances is show below. The attached pencil was provided to record the dances one participated in and ones partner. The cover has been archivally mended, as shown in the first picture in this listing, where the attached pencil string caused separation. A nice little item commemorating the inauguration of effectively two United States Presidents. I have seen only one other in recent years with a badly stained cover that was offered for $125.